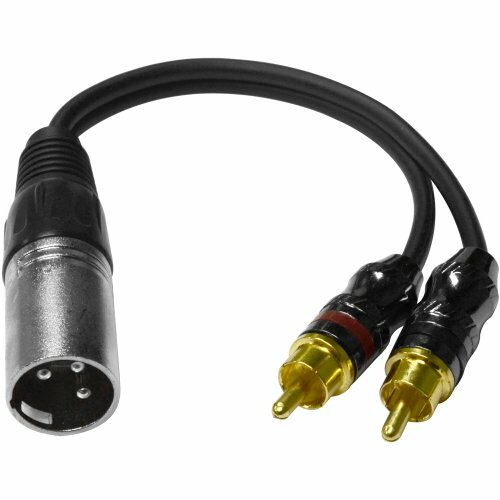 6 Inch Splitter Patch Y Cable - 1 XLR Male to 2 RCA Male - MODEL: SA-Y6, CONTENTS: One XLR Male to Dual RCA Male Y Splitter Cable, CONDITION: New, CONNECTORS: Metal XLR Male on one end - Metal Dual RCA Male on other end, APPLICATION: Connecting DJ Controllers to Amplifiers - Converting an XLR cable into a long RCA cable - Integrating Home theater and Pro Audio gear, LENGTH: 6 Inches, FEATURES: Flexible rubber jacket with high quality metal ends, FEATURES: Shielded - Insulated Copper conductors, WARRANTY: One Year Warranty. These XLR to dual RCA Y Splitter Cables have a variety of uses. Connect line outputs from mixing consoles, microphones, to recorders and amplifiers, connect DJ controllers to amplifiers, convert an XLR cable into a long RCA cable, even integrate home theater equipment with your Pro Audio gear...Anywhere you need to adapt from an XLR to RCA connection. This Y splitter cable produces high quality sound without unwanted noise. This is an unbalanced cable. With your purchase you will receive one XLR to dual RCA patch cable. You will also receive top notch customer service, plus all the technical expertise you will ever need is just a phone call or email away! Join the Seismic Audio revolution and see what tens of thousands already know. Whether it is for the garage band, live sound, stage, or studio...Seismic Audio is bang for the buck, the best Pro Audio gear for all PA applications!